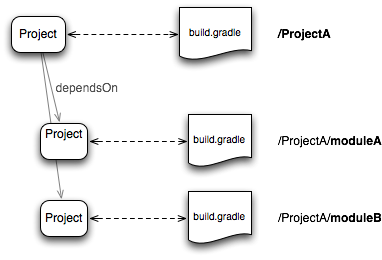 Using Gradle in Practice · JVM. Blog. One thing on my to-do list for a long time has been to switch GContracts  from Maven to Gradle. This blog post is about the basic concepts I learned from the migration and how parts of the resulting build.gradle look like. The pom.xml for GContracts build process can be found at github, but it mainly consists of plugins realizing the use-cases cited above. description = "GContracts provides closure annotations to support design by contract for Groovy classes." This means that during compilation the dependency to Groovy 1.7.6 will automatically be resolved in a transitive way. In order to resolve all libraries we need to specify a Maven repository location to obtain the library files - I chose Maven central. So far so good, next step is to setup the test environment. As I've already brought up, this is all valid Groovy code - we could use custom classes, custom plugins or custom Groovy functionality to adapt the build script for our (or the enterprise) needs. This is it. With the following build.gradle we can already compile Java and Groovy source-code, create javadocs, test and package GContracts - only be specifying the plugins, a repository, dependencies and very little meta-data. description = "GContracts provides closure annotations to support design by contract (tm) for Groovy"
assemble - Assembles all Jar, War, Zip, and Tar archives. groovydoc - Generates the groovydoc for the main source code. javadoc - Generates the javadoc for the main source code. dependencies - Displays the dependencies of root project 'gcontracts'. projects - Displays the sub-projects of root project 'gcontracts'. properties - Displays the properties of root project 'gcontracts'. tasks - Displays the tasks in root project 'gcontracts'. Pattern: build&lt;ConfigurationName&gt;: Assembles the artifacts of a configuration. Pattern: upload&lt;ConfigurationName&gt;: Assembles and uploads the artifacts belonging to a configuration. Pattern: clean&lt;TaskName&gt;: Cleans the output files of a task. Of course there is a way to define custom tasks in Gradle, we will have a look at when we implement uploading to the Maven repository. If you want to know more about it in advance, take a look at . with that dependency we can apply the third party plugin and thus import GPG signing functionality. We could specify arbitrary configuration data in the gradle.properties file, located in the .gradle directory - this would be a better place for keyId and password. The last requirement is uploading the signed artifacts to the OSS Sonatype Nexus staging repository. Therefore, we need to apply the Maven Gradle plugin  and specify additional data which will be part of the generated pom.xml. The source files, javadoc and binary are now signed and uploaded to the staging repository. This is exactly what we've been striving for. We're done for now.